Archaeologist Brennan Gauthier will present documentary evidence on various aspects of Chittenden County and the remarkably rich and diverse archaeological heritage that spans almost 13,000 years of human history. Come hear about the earliest human inhabitants of the area, campsites used by Paleo-Indians, 12th century Native American farming sites, and some of the animals that roamed here–including mammoths and mastodons. 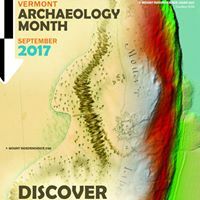 This event is part of Vermont Archaeology Month.